UNIGINE console is used for standard input, output and error streams for the file loading, rendering system, audio and video systems, path-finding system, physics engine, file system and many others. Can be opened in any UNIGINE-based application. The console can be hidden by pressing the grave accent (`) key one more time. See how to assign another key here. Command is a directive to a console to perform a specific task. Variable is an identifier that contains some stored value. To complete a command or variable name, just start typing first letters and press the TAB key until you get the required result. Basic operations on the console, command and variable. Command. Bind a key to a command. Command. Clear all messages from the console window. Variable. Print the ASCII code of the current console turning on or off key. Command. Assign a new key to turn on or off the console. Command. Print the list of the built-in commands. Command. Print a set of all available console keys, commands and variables. Command. Switch among all variable values. Make sure, that the variable is integer. Command. Enable or disable a variable. Enabled variable will have a default value. Command. Unbind a key from a command. Operations on the console GUI. Variable. Print a current size of the console font. Command. Set a size for the console font. Variable. Print a current path to a *.ttf file used as a console font. Command. Set a path to a *.ttf file to be used as a console font. Basic operations on the engine. Variable. Print a value specifying if all *_threaded console variables are enabled. Command. Globally Enable or disable all *_threaded console variables ( world_threaded , physics_threaded , pathfind_threaded ). If these variables are enabled, multithreading is used. Command. Prints the current engine version info. General operations on the engine configuration. Command. Load engine configuration from a configuration file. Variable. Print the value specifying if the data could be written to the configuration file. Command. Specify if the data could be written to the configuration file. Command. Save the engine configuration file. Operations on the engine debugging. Available only for debug builds. Command. Analyze the performance of the engine. Can be used only in the single-threaded mode. The information can be printed to the console or dumped into a specified file. Command. Load the specified world. A cache file can also be specified for faster application loading. Command. Clear all the world data. Materials won't be saved on running the command. To save them, use materials_save. Command. Reload the world. A cache file can also be specified to be reloaded. Variable. Print the value indicating which world handler is used. Command. Set the world handler. Command. Save states of all world nodes into the .save file and take a screenshot. File is saved as quicksave.save in the /bin/save directory by default. You can pass another directory as an argument. Command. Restore states of all world nodes. File is restored using quicksave.save file in the /bin/save directory by default. You can pass another directory as an argument. Operations, representing information on ObjectGrass, ObjectMeshClutter andWorldClutter objects. Command. Print the list of resources handled by the world manager (mask images for ObjectGrass and WorldClutter objects), if any. To get information on loaded meshes and images, see the Render resources section. Operations on the world queued nodes. Command. Print names of all the queued nodes, if any. Variable. Print the current time delay between loading of the queued nodes in seconds. Command. Set the time delay between loading of the queued nodes in seconds. For example, this function can be used to debug streaming of resources. Command. Clear the queue and all of the loaded nodes. Variable. Print the value indicating if sound occlusion is enabled. Command. Occlude sound if other nodes are found in front of the sound source. Variable. Print the current sound reverberation mode. Command. Set a sound reverberation mode. Operations on the sound resources. Variable. Print the value indicating if sound samples are preloaded on world loading. Command. Preload sound samples on world loading (ensure there are no lags afterwards but increases loading time and memory footprint). Command. Print general information on sound resources: the number of static and streamed sound sources (registered/loaded; memory used). Command. Print the detailed list of sound files, if any, with used space. Variable. Print the current cache memory limit for static sound resources in Mbytes. Command. Set the cache memory limit for static sound resources in Mbytes. Variable. Print the current cache memory limit for streamed sound resources in Mbytes. Command. Set the cache memory limit for streamed sound resources in Mbytes. material_load Command. Loads the specified manual material. Path to the manual material file. material_reload Command. Reloads the specified manual material. Path to the manual material file. material_create_shaders Command. Creates all shaders for the specified manual material. Path to the manual material file. material_manager_info Command. Prints information on all loaded materials (e.g. the number of loaded shaders; states, textures and parameters that don't exist in the parent material). materials_reload Command. Reloads all loaded materials. materials_save Command. Saves all loaded materials. shaders_create Command. Creates all shaders for all loaded materials, updates the shaders cache if necessary, and loads shaders to RAM. shaders_create_all Command. Creates possible shader combinations for the current configuration. shaders_compile Command. Compiles shaders for all loaded materials. shaders_destroy Command. Removes all shaders from RAM. This command can be used to clear RAM after shader cache generation. Operations for fast positioning of the game camera. camera_get Command. Get the current position of the game camera and its rotation (Euler angles). camera_set Command. Set position and rotation (Euler angles) of the game camera. Position and rotation of the game camera can be changed only if it is unlocked. The first 3 arguments set position. Operations on the File system. Command. Remove all non-existent file system paths. Variable. Print the list of ignored directories. Command. Set the folders to be ignored within the data directory. It can be used to discard version control system folders. This option comes into effect only after the filesystem_reload command is run. Multiple values are comma separated (no whitespaces). Variable. Print the value indicating if memory-mapped files are used. Command. Use memory-mapped files for faster access. Command. Reload the file system, thereby update the list of files. Command. Saves all file system guids to the specified file path in JSON format, or binary format if the corresponding flag is set. Operations, representing information on the File system. Command. Print the list of all file system guids. Command. Print general file system information (the total number of files and files per package). Command. Print the list of all files. Command. Load UnigineEditor (both Qt and Unigine-native GUI will be loaded). Command. Quit UnigineEditor (both Qt and Unigine-native GUI will be hidden). Command. Reload UnigineEditor (both Qt and Unigine-native GUI will be reloaded). This command reloads the editor script, all unsaved changes are lost. Command. Enable or disable default preset editing. Command. Print information on the number of non-native assets and runtime files generated for them. Command. Print the list of all non-native assets and information on runtime files generated for them (file path, alias). Operations on the world, system and editor scripts. Operations on the editor script debugging. Command. 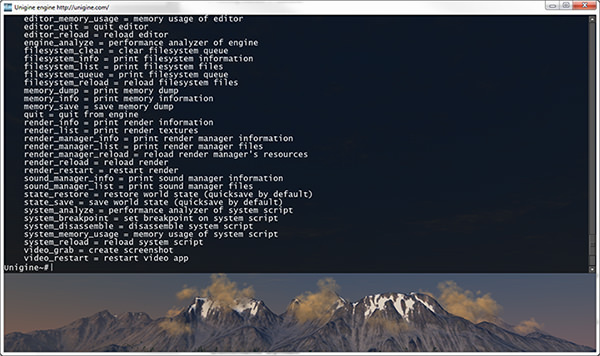 Print memory usage by the editor script to the console or dump into a specified file. Command. Analyze the performance of the editor script. Can be used only in the single-threaded mode. The information can be printed to the console or dumped into a specified file. Command. Disassemble the editor script. The information can be printed to the console or dumped into a specified file. Operations on the system script debugging. Command. Print memory usage by the system script to the console or dump into a specified file. Command. Analyze the performance of the system script. Can be used only in the single-threaded mode. The information can be printed to the console or dumped into a specified file. Command. Disassemble the system script. The information can be printed to the console or dumped into a specified file. Operations on the world script debugging. Command. Print memory usage by the world script to the console or dump into a specified file. Command. Analyze the performance of the world script. Can be used only in the single-threaded mode. The information can be printed to the console or dumped into a specified file. Command. Disassemble the world script. The information can be printed to the console or dumped into a specified file. Variable. Print the cache memory limit set for images in MB. Command. Set the cache memory limit for images in MB. Variable. Print the cache memory limit set for meshes in MB. Command. Set the cache memory limit for meshes in MB. Command. Set a breakpoint to the specified function in the world script. Command. Set a breakpoint to the specified function in the system script. Command. Set a breakpoint to the specified function in the editor script. Variable. Print the thread mode used to update the world. Command. Specify if the world will be updated in a single or multiple-threaded mode. Multiple-threaded mode creates 8 thread jobs and splits the nodes hierarchy: it finds root nodes (with their children) and distributes them in a balanced manner. Nodes are distributed between thread jobs, thread jobs are distributed between CPUs cores. Then, in each thread, it selects nodes to be updated. Thus, world update takes less time in case of complex nodes hierarchy. Variable. Print the value indicating how many threads are used to perform physical calculations. Command. Set a number of threads used to perform physical calculations. Variable. Print the value indicating how many threads are used to perform pathfinding calculations. Command. Set a number of threads used to perform pathfinding calculations. Available for debug builds only, won't work for release builds. Variable. Print the value indicating which engine component's operations are shown. Command. Print the list of asynchronous operations (loading / unloading of images, meshes, files, etc.) related to the specified engine component. You can specify whether only loading and unloading operations, or all operations should be shown. Variable. Print the value indicating whether only loading and unloading operations, or all operations are shown via async_log_mode . Command. Specify whether only loading and unloading operations, or all operations will be shown via async_log_mode . Command. Print the info on async queue resource count and memory usage. Command. Print the list of async queue resources. Command. Clear the async queue. To debug the world and objects within it, the show_visualizer command should be set to 1. Variable. Print the current visualizer mode. Command. Specify if the visualizer geometry (bounding volumes, wireframe, physics bodies and shapes, etc.) is shown. Variable. Print the value indicating if the FPS counter is hidden. Command. Show or hide the FPS counter. 2 - display the FPS counter and statistics on the last 600 frames: minimum FPS, maximum FPS and average FPS for the last 600 frames. Variable. Print the value indicating if the system messages are displayed in the viewport. Command. Hide the system messages. Operations on the world debugging. Variable. Print the value indicating if the scene spatial tree is displayed. Command. Display the scene spatial tree. Variable. Print the list of node types for which the visualizer is displayed. Command. Set node types for which the visualizer is displayed. To hide the visualizer, pass "" as a argument. Variable. Print the current wireframe mode for scene triangles. Command. Set the wireframe mode for scene triangles. Operations on the node debugging. Variable. Print the value indicating if nodes handlers for lights, particle systems, sectors, portals and so on are displayed. Command. Display nodes handlers for lights, particle systems, sectors, portals, etc. To hide all handlers, pass "" as an argument. Variable. Print the value indicating if the wireframe for decals is displayed. Command. Display the wireframe for decals. Operations on the occluder debugging. Variable. Print the value indicating if buffer used for occluders is displayed in the viewport. Command. Display buffer used for occluders displayed in the viewport. Variable. Print the value indicating if collision surfaces are displayed. Variable. Print the value indicating if contact points between physical bodies are displayed. Command. Display/hide contact points between physical bodies. Variable. Print the value indicating if joints between physical bodies are displayed. Command. Display/hide joints between physical bodies. Variable. Print the value indicating if collision shapes for physical bodies are displayed. Command. Display/hide collision shapes for physical bodies. Operations on the texture debugging. Variable. Print the value indicating if mipmap levels are displayed in color. Command. Display mipmap levels in color. Variable. Print the value indicating if occlusion query boxes are displayed. Command. Display occlusion query boxes. Make sure that the Culled by occlusion query flag is set for nodes. Operations on the Performance profiler. Variable. Print a mode set to Performance profiler. Command. Specify a mode for Performance profiler. Operations on the Performance profiler style. Variable. Print a current size of the profiler font. Command. Set a size for the profiler font. Variable. Print a current path to a *.ttf file used as a profiler font. Command. Set a path to a *.ttf file to be used as a profiler font. Command. Print the Microprofile settings: maximum number of frames that can be profiled, number of dump frames, flag indicating if GPU profiling is enabled, Web server status, Web server port, number of webserver frames. If the application is compiled without Microprofile, the corresponding message will printed to the console. Variable. Print the value indicating if GPU profiling is enabled. Command. Set the value indicating if GPU profiling is enabled. Variable. Print the number of frames that will be visualised in your Web browser. Command. Set the number of frames that will be visualised in your Web browser. Variable. Print the number of frames that will be included in the Microprofile dump (saved to the .csv or .html file). Command. Set the number of frames that will be included in the Microprofile dump (saved to the .csv or .html file). Command. Save the Microprofile dump to a .csv file. A path to a .csv file. If the path doesn't specified, the dump is saved to data/microprofile_dump_csv folder. Command. Save the Microprofile dump to an .html file. A path to an .html file. If the path doesn't specified, the dump is saved to data/microprofile_dump_html folder. To come to effect, the commands below require video_restart to be run after them. Command. Restart the video application to apply changes to video settings, if any. Operations on the video resolution adjustment. Variable. Print the current video resolution mode. Command. Set a new video resolution mode. Variable. Print the current screen width. Command. Set the custom screen width. Valid only if the video_mode command is set to -1. Variable. Print the current screen height. Command. Set the custom screen height. Variable. Print the value indicating if the application window is resizable. Command. Set a resizable mode for an application window (its size can be changed on the fly without restarting the application). Variable. Print the value indicating if the application is running in full-screen mode. Command. Set full-screen mode for the application window. Operations on the graphics adjustment. Variable. Print the value indicating if the vertical FPS synchronization is enabled. Command. Set the vertical FPS synchronization. Variable. Print the current graphics refresh rate. Command. Set the graphics refresh rate. Variable. Print the current gamma correction value. Command. Set the gamma correction value. Variable. Print a value indicating whether rendering across 3 monitors is enabled or not. Command. Enable or disable rendering of the application across 3 monitors. Variable. Print the size of monitor bezel compensation in pixels. Command. Set the size of monitor bezel compensation in pixels. It is used together with video_surround enabled. Variable. Print a value indicating if quad buffering is enabled. Command. Enable quad buffered stereo. Command. Reload the renderer. This command reloads all shaders (but does not update shader variables - it is done automatically). It can also be called, for example, for graphics API changes to come to effect. Command. Reload all render textures. Command. Reload all render manager resources. You can specify an optional argument to reload resources selectively. Operations, representing information on the rendering resources. Command. Print current render budget value, which limits the number of loaded/created graphics resources during a frame according to loading/creation time. Budget value is measured seconds. The default value is 1/60. TextureManaged (textures loaded into memory at once) and TextureStream (textures streamed on demand) with texture format, used compression, if any, texture dimensions and size (available only for already loaded textures). Operations, representing information on the rendering buffers. Command. Print the detailed list of render buffers, with texture size, format and used space. Operations on the rendering buffer debugging. Variable. Print the current set of buffers used by the renderer. Command. Specify a mode of textures buffers used by the renderer (how many buffers are shown depends on the number of buffers in a row specified by the render_show_textures_number ) command. 1 - show render textures (compact). 2 - show render textures (full). Variable. Print the value indicating if RGBA16F texture format is used for screen HDR buffers. Command. Set a value indicating if RGBA16F texture format is used for screen HDR buffers. 1 - use RGBA16F texture format (by default). Variable. Print the current number of buffers in a row to be output to the screen. Command. Set the number of buffers in a row to be output to the screen. Variable. Print the number of the buffer to start displaying from in the full view mode. Command. Set the number of the buffer to start displaying from in the full view mode. Variable. Print the list of materials to be used at the Deferred Composite stage of rendering sequence as a string constant. Command. Update the list of materials to be used at the Deferred Composite stage of rendering sequence. Variable. Print the value indicating if the rendering of debug materials is enabled. Command. Enable the rendering of debug materials (the debug_materials material). Debug materials can be used for debugging of image generation stages. Variable. Print the list of debug materials to be rendered as a string constant. Command. Update the list of debug materials to be rendered. Rendering of debug materials must be enabled. Variable. Print the value indicating if scissor rectangles are shown. Command. Enable displaying of the ambient pass buffer. Variable. Print the value indicating if the visualizer is displayed for objects using alpha test. Command. Display the visualizer for objects that are using alpha test. Variable. Print the value indicating if the visualizer is displayed for transparent objects. Command. Display the visualizer for transparent objects. Variable. Print the value indicating if rendering of clouds is skipped. Command. Skip rendering of clouds. Variable. Print the value indicating if rendering of lights is skipped. Command. Skip rendering of lights. Variable. Print the value indicating if rendering of water is skipped. Command. Skip rendering of water. Variable. Print the value indicating if the rendering of post materials is skipped. Command. Skip the rendering of post materials. Variable. Print the value indicating if the rendering of render materials is skipped. Command. Skip the rendering of render materials. Variable. Print the value indicating if the transparent pass is skipped. Command. Skip the transparent pass. This console command takes effect only when the forward rendering pass is used for transparent objects rendering. Variable. Print the value indicating if the ambient rendering pass is skipped for transparent objects rendering. Command. Skip the ambient rendering pass for transparent objects rendering. Variable. Print the value indicating if the rendering pass for world lights is skipped for transparent objects rendering. Command. Skip the world lights' rendering pass for transparent objects rendering. Variable. Print the value indicating if the deferred pass for transparent objects is skipped. Command. Skips the deferred pass for transparent objects. Variable. Print the value indicating if the multiple environment probes mode for transparent objects is disabled. Command. Disables the multiple environment probes mode for transparent objects. Operations on the mesh rendering. Variable. Print the value indicating if alpha fading (dithering) is enabled for objects. Command. Use alpha fading (dithering) for objects. Variable. Print the value indicating if the visualizer for dynamic objects is displayed. Command. Display the visualizer for dynamic objects. Operations on the mesh loading. Variable. Print the current loading mode for the dummy meshes. Command. Preload dummy meshes (without any vertex data, only surfaces) on the world start-up. Meshes with full geometry data are loaded on demand, when they get into the view frustum. This option increases the world loading time, but safeguards against any lags on resource loading in run-time. This command doesn't force loading of meshes of ObjectMeshStatic, ObjectMeshClutter and ObjectMeshCluster. Variable. Print the current loading mode for all meshes. Command. Load all meshes on the start-up. This option insures against any lags on mesh loading at run-time, but increases world loading time. Variable. Print the current cache memory limits for meshes, in percentage of the total GPU memory. Command. Set the cache memory limits for meshes, in percentage of the total GPU memory. Variable. Print the current resource check interval, in number of frames. Command. Set the resource check interval, in number of frames. Variable. Print the current resource update interval, in number of frames. Command. Set the resource update interval, in number of frames. Variable. Print the value indicating if decals should be rendered. Operations on the field rendering. Variable. Print the current resolution of the texture into which all textures set for all FieldHeight objects are rendered. Command. Set resolution of the texture into which all textures set for all FieldHeight objects are rendered. Command. Set the precision of textures used for field objects. Variable. Print the current resolution of the texture into which all textures set for all FieldShoreline objects are rendered. Command. Set resolution of the texture into which all textures set for all FieldShoreline objects are rendered. Operations on the texture rendering. Variable. Print the current texture resolution. Command. Set the texture resolution. Variable. Print the current maximum texture resolution. Command. Set maximum resolution of all textures. The engine doesn't compress existing textures: it uses specified mipmaps of *.dds textures. Variable. Print the current minimum texture resolution. Command. Set minimum resolution of all textures. The engine doesn't compress existing textures: it uses specified mipmaps of *.dds textures. Variable. Print the current texture filtering mode. Command. Set the texture filtering mode. Variable. Print the current texture anisotropy level. Command. Set the texture anisotropy level. Operations on the texture loading. Variable. Print the current loading mode for all textures. Command. Load all textures on the start-up. This option insures against any lags on textures loading at run-time, but increases world loading time. Variable. Print the current cache memory limits for textures, in percents of the total GPU memory. Command. Set the cache memory limits for textures, in percents of the total GPU memory. Command. Reload all render manager's textures. Variable. Print the current maximum texture chunk size for uploading to GPU, in bytes. Command. Set the current maximum texture chunk size for uploading to GPU, in bytes. Variable. Print the current percentage of the frame, that can be used for uploading textures to GPU. Command. Set the current percentage of the frame, that can be used for uploading textures to GPU. Command. Print the macros list related to the renderer (defines to make corresponding resources available in shaders). Operations on the shader loading. Variable. Print the value indicating if shaders are compiled on the start-up. Command. Compile all shaders that are used in the loaded world on start-up. This command compiles and loads all shaders to RAM every time the world is loaded, which results in significant memory consumption. It is recommended to use pre-generated shaders cache instead when possible (see the shaders_create command). In this case necessary shaders are loaded from cache to RAM on demand. Operations on the effects and postprocesses. Variable. Print the value of a global scale for rotation angle of vegetation leaves. Command. Sets the global scale for rotation angle of vegetation leaves. Variable. Sets the value of a global scale for rotation speed of vegetation leaves. Command. Sets the global scale for rotation speed of vegetation leaves. Variable. Print the global scale for movement amplitude of vegetation stems. Command. Set the global scale for movement amplitude of vegetation stems. Variable. Print the offset for vegetation under wind by X, Y and Z axes. Command. Sets the direction of wind for all vegetation (grass and trees). It is a multiplier for the stem offset (in grass, stem and leaves materials). Variable. Print the value indicating if the auxiliary render buffer is enabled. Variable. Print the value indicating if the ray-traced bent normals calculation is enabled. Command. Enable the ray-traced bent normals calculation. The use of bent normals allows for smooth ambient lighting. Command. Enable the ray-traced bent normals calculation. This option reduces noise by using the blur effect. Variable. Print the value of the threshold for the ray-traced bent normals calculation. Command. Set the threshold value for the ray-traced bent normals calculation. Variable. Print the value indicating if the bloom effect is enabled. Command. Enable the bloom effect. Variable. Print the current number of passes for the bloom effect. Command. Set the number of passes for the bloom effect. During each pass a bloom texture is generated. Up to 8 bloom textures can be generated: each texture has lower resolution (original size, original size /2, original size /4, so forth) with bloom effect. After that, all these bloom textures with the different resolution are composed for the final bloom texture.. Variable. Print the value of the power of the bloom effect. Command. Set the power of the bloom effect. Variable. Print the value of the bloom scale. Command. Set the value of the bloom scale. Variable. Print the width of the image border (in pixels), to be rendered outside the bounds of the screen to reduce artefacts of post effects. Command. Set the width of the image border (in pixels), to be rendered outside the bounds of the screen to reduce artefacts of post effects. Increasing the width of the border may increase performance costs. Variable. Print the brightness threshold, which is used to detect if an object should be blurred in the HDR mode. Command. Set the threshold, which is used to detect if an object should be blurred in the HDR mode. Variable. Print the value indicating if temporal filtering is enabled. Command. Toggles temporal filtering on and off. Variable. Print the scale of lens dirt effect modulating the pattern of lens flares. Command. Set the scale of lens dirt effect modulating the pattern of lens flares. For example, it can be used to create an effect of unclean optics when the camera looks at the sun. Variable. Print the value indicating if the Gaussian blur depth of field effect is enabled. Command. Enable the Gaussian blur depth of field effect. Variable. Print the intensity of blur for DoF (Depth Of Field) effect. Command. Set the intensity of blur for DoF (Depth Of Field) effect. Variable. Print the intensity of chromatic aberration effect for DoF (Depth Of Field). Command. Set the intensity of chromatic aberration effect for DoF (Depth Of Field). Variable. Print the far DoF limit of the camera. Command. Set the far DoF limit of the camera. The distance between the camera and the furthest element that is considered to be acceptably sharp. Variable. Print the near DoF limit of the camera. Command. Set the near DoF limit of the camera. The distance between the camera and the nearest element that is considered to be acceptably sharp. Variable. Print the value of the camera focal distance. Command. Set the focal distance of the camera, i.e. a point where objects are in-focus and clear. Variable. Print the far focal offset for DoF (Depth Of Field) effect. Command. Set the far focal offset for DoF (Depth Of Field) effect. The offset from the focal point to the furthest blurred zone. Variable. Print the near focal offset for DoF (Depth Of Field) effect. Command. Set the near focal offset for DoF (Depth Of Field) effect. The offset from the focal point to the nearest blurred zone. Variable. Print the value indicating the resolution of DOF. Command. Set the DOF rendering resolution. Variable. Print the value indicating the quality of DOF. Command. Set the DOF rendering quality. Variable. Print the value indicating the mode of Bokeh DOF effect. Command. Set the DOF Bokeh effect mode. Variable. Print the value indicating if the DOF increased accuracy is enabled. Command. Enable or disable the DOF increased accuracy. Enabling the parameter allows for increasing accuracy of focusing calculation. Variable. Print the value indicating if focus improvement is enabled for the DOF effect. Command. Enable or disable focus improvement for the DOF effect. When enabled, transitions between the focused and unfocused parts of the scene become more accurate. Variable. Print the mode of the adaptive exposure effect. Command. Set the mode of the adaptive exposure effect. Variable. Print the camera exposure value. Command. Set the camera exposure value. Available only when render_camera_mode = 0. Variable. Print the value of the period of exposure adaptation. Command. Set the value of the period of exposure adaptation. Variable. Print the current ISO value set for the physically-based camera. Command. Set the ISO for the physically-based camera. Variable. Print the shutter speed set for the physically-based camera. Command. Set the shutter speed set for the physically-based camera. Variable. Print the F-stop value set for the physically-based camera. Command. Set the F-stop value set for the physically-based camera. Variable. Print the value indicating which camera mode is set. If the classic camera is used, the static exposure is set directly. If the physically-based camera is use, the static exposure calculation is based on physical parameters of the camera (ISO, shutter speed and f-stop). Variable. Print the number of samples per pixel used for supersampling. Command. Set the number of samples per pixel used for supersampling. Variable. Print the value indicating if rendering of occluders is enabled. Command. Enable or disable rendering of occluders. Variable. Print the current resolution of the texture, to which occluders are rendered. Command. Set the resolution of the texture, to which occluders are rendered. Variable. Print the value indicating if rendering of occluders for shadows is enabled. Command. Enable or disable rendering of occluders for shadows. Variable. Print the current resolution of the texture, to which occluders for shadows are rendered. Command. Set the resolution of the texture, to which occluders for shadows are rendered. Variable. Print the value indicating if SSGI effect is enabled. Command. Enable or disable the SSGI (Screen Space Global Illumination) effect. Variable. Print the value of the SSGI radius. Command. Set the radius of the SSGI (Screen Space Global Illumination). Variable. Print the value of the SSGI intensity. Command. Set the intensity of the SSGI (Screen Space Global Illumination) for the scene. Variable. Print the value of the SSGI normal threshold. Command. Set the normal threshold of the SSGI (Screen Space Global Illumination). Variable. Print the SSGI effect resolution. Command. Set the resolution of SSGI (Screen Space Global Illumination). Variable. Print the value of the resolution of the color buffer used for SSGI. Command. Set the resolution of the color buffer used for SSGI (Screen Space Global Illumination) calculation. This option significantly affects performance. Variable. Print the SSGI effect quality. Command. Sets the quality of the SSGI (Screen Space Global Illumination) (the number of the used samples). Variable. Print the value indicating if the ray tracing is used for SSGI (Screen Space Global Illumination) calculation. Command. Enable the ray tracing for SSGI (Screen Space Global Illumination) calculation. When enabled, SSGI recreates light reflections from the object’s surface. Ray-traced SSGI calculation is available only when the SSRTGI technique is enabled. Variable. Print the value indicating if the noise reduction for the ray-traced SSGI (Screen Space Global Illumination) is enabled. Command. Enable the noise reduction for the ray-traced SSGI (Screen Space Global Illumination). This option reduces noise by using blur effect. Ray-traced SSGI calculation is available only when the SSRTGI technique is enabled. Variable. Print the current threshold value for the ray-traced SSGI (Screen Space Global Illumination). Command. Set the threshold value for the ray-traced SSGI (Screen Space Global Illumination). Ray-traced SSGI calculation is available only when the SSRTGI technique is enabled. Variable. Print the value indicating if the FXAA is enabled. Command. Enable or disable the FXAA. Variable. Print the value of the FXAA intensity. Command. Set the intensity of the FXAA. Intensity specifies the sample offset of FXAA fragment. Variable. Print the value indicating if the TAA is enabled. Command. Enable or disable the TAA. Variable. Print the frame count of TAA. Command. Set the frame count of TAA (Temporal Anti-Aliasing). It specifies the number of frame for velocity buffer. Variable. Print the value indicating if the Catmull-Rom resampling is enabled. Command. Toggles the Catmull-Rom resampling on and off. It allows you to reduce image blurring when the camera moves forward/backward. It is recommended to disable resampling at low settings. Variable. Print the value indicating if TAA color clamping is enabled. Command. Enable or disable TAA color clamping (when TAA is enabled). This command clamps the color of the current and previous frame. The image becomes more sharp. Variable. Print the value indicating if diagonal neighboring pixels are to be taken into account in the process of color clamping. Command. Set the value indicating if diagonal neighboring pixels in the process of color clamping. Variable. Print the value of the detail level of TAA (Temporal Anti-Aliasing). Command. Set the value for the detail level of TAA (Temporal Anti-Aliasing). The higher the value - the more detailed is the image. Can produce additional flickering. Variable. Print the size of the sample offset performed during sub pixel jittering. Command. Set the size of the sample offset performed during sub pixel jittering. By default, samples shift to one pixel during sub pixel jittering: you can lower this offset. Variable. Print the number of the sample offsets performed during sub pixel jittering. Command. Set the number of the sample offsets performed during sub pixel jittering. By the minimum value of 1, there will be no offsets, and, therefore, no anti-aliasing. Variable. Print the maximum frame count of TAA. Command. Sets the maximum frame count of TAA (Temporal Anti-Aliasing). Specifies the maximum number of frames for velocity buffer. Variable. Print the minimum frame count of TAA. Command. Sets the minimum frame count of TAA (Temporal Anti-Aliasing). Specifies the minimum number of frames for velocity buffer. Variable. Print the value indicating if TAA velocity clamping is enabled. Command. Enable or disable TAA velocity clamping (when TAA is enabled). This command controls the number of frames for velocity buffer. That reduces the blurring in dynamic scenes with a lot of moving objects. Variable. Print the value of the TAA velocity threshold. Command. Sets the velocity threshold of TAA (Temporal Anti-Aliasing). This value specifies the intensity of velocity clamping. Variable. Print the value indicating if the bright pixels flicker fix is enabled. Command. Enable or disable the bright pixels flicker fix (when TAA is enabled). Enabling fix flicker may increase performance costs. Variable. Print the value indicating if the filmic high-dynamic range color correction rendering is enabled. Command. Enable the filmic high-dynamic range color correction rendering. Variable. Print the shoulder strength filmic tonemapping parameter value. Command. Set the shoulder strength filmic tonemapping parameter value. Variable. Print the linear strength filmic tonemapping parameter value. Command. Set the linear strength filmic tonemapping parameter value. Variable. Print the linear angle filmic tonemapping parameter value. Command. Set the linear angle filmic tonemapping parameter value. Variable. Print the toe scale filmic tonemapping parameter value. Command. Set the toe scale filmic tonemapping parameter value. Variable. Print the toe numerator filmic tonemapping parameter value. Command. Set the toe numerator filmic tonemapping parameter value. Variable. Print the toe denominator filmic tonemapping parameter value. Command. Set the toe denominator filmic tonemapping parameter value. Variable. Print the white level filmic tonemapping parameter value. Command. Set the white level filmic tonemapping parameter value. Variable. Print the value indicating if the bokeh effect is enabled. Command. Enable the bokeh effect. Variable. Print the value indicating if the cross flares effect is enabled. Command. Enable the cross flares effect. Variable. Print the color of the cross flares. Command. Set the color of the cross flares. Variable. Print the value of the scale of the cross flares. Command. Set the scale of the cross flares, higher values produce more pronounced flares. Variable. Print the number of shafts in a cross flare. Command. Set the number of shafts in a cross flare. High number of flares can cause a FPS drop on low-performance hardware. Variable. Print the length of a cross flare. Command. Set the length of a cross flare. Higher values also lead to fading of the shafts across their length. Variable. Print the cross flares orientation angle. Command. Set the cross flares orientation angle. Variable. Print the brightness threshold for areas to produce cross flares. Command. Set the brightness threshold for areas to produce cross flares. The higher the threshold value, the brighter the area should be to produce flare. Variable. Print the global distance scale for all distance parameters: shadow distance, light distance, LOD distances, etc. Command. Set the global distance scale for all distance parameters: shadow distance, light distance, LOD distances, etc. Variable. Print the distance starting from which the Clutter nodes will not be rendered. Command. Set the distance starting from which the Clutter nodes will not be rendered. Variable. Print the distance starting from which the Decal nodes will not be rendered. Command. Set the distance starting from which the Decal nodes will not be rendered. Variable. Print the distance starting from which the Field nodes will not be rendered. Command. Set the distance starting from which the Field nodes will not be rendered. Variable. Print the distance starting from which the Light nodes will not be rendered. Command. Set the distance starting from which the Light nodes will not be rendered. Variable. Print the distance starting from which the Object nodes will not be rendered. Command. Set the distance starting from which the Object nodes will not be rendered. Variable. Print the value indicating if dynamic reflection is enabled. Variable. Print the value indicating if dynamic reflections blurring is enabled. Command. Enables blurring of dynamic reflections for materials. Variable. Print the value indicating if reduction of resolution of dynamic reflections when the camera moves away is enabled. Command. Enable reduction of resolution of dynamic reflections when the camera moves away. Variable. Print the distance starting from which reflections will not be rendered. Command. Set the distance starting from which reflections will not be rendered. Variable. Print the value of the wireframe color. Command. Sets the color for the wireframe. Variable. Print the value of the background color. Command. Sets the color for the background. Variable. Print the fade color of the scene. Command. Set the fade color of the scene. Variable. Print the value indicating if the lens flares effect is enabled. Command. Enable the lens flares effect. Variable. Print the value of the lens flares color. Command. Set the value of the lens flares color. Variable. Print the value of the lens flares scale. Command. Set the value of the lens flares scale. Variable. Print the value of the lens flares length, indicating if the whole radial lens flare is rendered on the screen or only a part of it. This option controls how lens flares pattern is distributed. Command. Set the value of the lens flares length, indicating if the whole radial lens flare is rendered on the screen or only a part of it. This option controls how lens flares pattern is distributed. Variable. Print the value of the lens flares radius on the screen. Command. Set the value of the lens flares radius on the screen. Variable. Print the value of the brightness threshold for areas to produce lens flares. Command. Set the value of the brightness threshold for areas to produce lens flares: the higher the threshold value, the brighter the area should be to produce flares. Variable. Print the value of the lens flares dispersion: displacement for for red, green and blue channels. Command. Set the value of the lens flares dispersion: displacement for for red, green and blue channels. Variable. Print the value indicating if the motion blur effect is enabled. Command. Enable the motion blur effect. Variable. Print the value indicating if neat silhouettes option for motion blur is enabled. Command. Enable the neat silhouettes option for motion blur. This option keeps contours of objects in front of the camera unblurred. Variable. Print the value of the current motion blur intensity. Command. Set the intensity of the noise used in the motion blur. Variable. Print the current number of steps used in the motion blur. Command. Set the number of steps used in the motion blur. Variable. Print the scale value of bodies' linear and angular velocities used for the motion blur. Command. Set the scale value of bodies' linear and angular velocities used for the motion blur. Variable. Print the maximum scaled velocity of bodies used for the motion blur. Command. Set the maximum scaled velocity of bodies used for the motion blur. Variable. Print the value indicating if the transparent blur effect is enabled. Command. Enable the transparent blur for materials. This option makes it possible to render matte transparent materials like matte glass. Variable. Print the value indicating if refraction is enabled. Variable. Print the value of the refraction displacement. Command. Sets the refraction displacement for red, green and blue channels (according to refraction texture of refractive materials). Can be used to create light dispersion (chromatic aberrations). Variable. Print the value indicating if the sharpening effect is enabled. Command. Enable or disable the sharpening effect. Variable. Print the value of the sharpening effect intensity. Command. Set intensity of the sharpening effect. Variable. Print the value indicating the current VR-emulation mode. Command. Set the VR-emulation mode. Variable. Print the value indicating the current stereo rendering mode. Command. Set the stereo rendering mode (it is not possible to set a stereo mode via a console if a default system script is used; it allows for setting it only on the start-up). Variable. Print the value indicating if screen space reflections are enabled. Command. Enable or disable screen space reflections. Variable. Print the value indicating if the importance sampling mode is enabled for the SSR effect. Command. Enable the importance sampling mode for the SSR effect. Variable. Print the value indicating if fast tracing is enabled for the SSR effect. Command. Enable fast tracing for the SSR effect. Variable. Print the value indicating if increased accuracy is enabled for the SSR effect. Command. Enable increased accuracy for the SSR effect. Variable. Print the value indicating if noise reduction is enabled for the SSR effect. Command. Enable noise reduction for the SSR effect. Variable. Print the resolution of screen space reflections. Command. Set the resolution of screen space reflections. Variable. Print the resolution of the depth buffer used for SSR calculation. Command. Set resolution of the depth buffer used for SSR calculation. Variable. Print the resolution of the color buffer used for SSR calculation. Command. Set resolution of the color buffer used for SSR calculation. Variable. Print the current quality of screen space reflections roughness. Command. Set the quality of screen space reflections roughness. Variable. Print the number of rays of SSR per pixel that are used to calculate rough refrections. Command. Set the number of rays of SSR per pixel that are used to calculate rough refrections. Variable. Print the number of steps of SSR per ray that are used for trace calculation. Command. Set the number of steps of SSR per ray that are used for trace calculation. Variable. Print the value size of the trace step used for SSR calculation. Command. Set the size of the trace step used for SSR calculation. Variable. Print the value . Command. Set the intensity of the ray noise used for SSR calculation. Command. Set the intensity of the step noise used for SSR calculation. Variable. Print the minimum roughness value starting from which the SSR effect begins to fade out. Command. Set the minimum roughness value, starting from which the SSR effect begins to fade out. Variable. Print the maximum roughness value starting from which the SSR effect is not rendered. Command. Set the maximum roughness value, starting from which the SSR effect is not rendered. Variable. Print the value that limits imitation of reflections in areas where SSR cannot get information..
Command. Set the value that limits imitation of reflections in areas where SSR cannot get information. Variable. Print the value that limits imitation of environment cubemap occlusion in areas where SSR cannot get information. Command. Set the value that limits imitation of environment cubemap occlusion in areas where SSR cannot get information. Variable. Print the value indicating if the SSRTGI (Screen-Space Ray-Traced Global Illumination) effect enabled. Command. Enable or disable SSRTGI. Variable. Print the value indicating if the fast tracing for SSRTGI is enabled. Command. Enable or disable fast tracing for the SSRTGI. This option dynamically changes the step size to obtain indirect illumination bounces using low number of steps while keeping performance high. Disabling this option improves quality, but significantly reduces performance. To use this option, the SSRTGI effect must be enabled. Variable. Print the value indicating if the increased accuracy for SSRTGI is enabled. Command. Enable or disable the increased accuracy for the SSRTGI. This option reduces visual artifacts by increasing accuracy of the last step. To use this option, the SSRTGI effect must be enabled. Variable. Print the value of the SSRTGI ray noise intensity. Command. Set the intensity of the ray noise used for the SSRTGI calculation. This parameter is used to reduce the banding effect. The higher is the value, the less pronounced is the banding effect. To use this option, the SSRTGI effect must be enabled. Variable. Print the value of the SSRTGI step noise intensity. Command. Set the intensity of the step noise used for SSRTGI calculation. This parameter is used to reduce the banding effect. To use this option, the SSRTGI effect must be enabled. Variable. Print the number of rays used for SSRTGI calculation. Command. Set the number of rays used for SSRTGI calculation. The higher the value, the better quality. However, this option significantly affects performance. To use this option, the SSRTGI effect must be enabled. Variable. Print the number of steps used for SSRTGI calculation. Command. Set the number of steps used for SSRTGI calculation. he higher is the value, the better is the quality. However, this option significantly affects performance. To use this option, the SSRTGI effect must be enabled. Variable. Print the resolution of SSRTGI. Command. Set the resolution of SSRTGI. To use this option, the SSRTGI effect must be enabled. Variable. Print the resolution of the depth buffer used for SSRTGI calculation. Command. Sets the resolution of the depth buffer used for SSRTGI calculation. To use this option, the SSRTGI effect must be enabled. Variable. Print the size of the step used for SSRTGI calculation. Command. Set the size of the step used for SSRTGI calculation. To use this option, the SSRTGI effect must be enabled. Variable. Print the value indicating if the upscaling for SSRTGI is enabled. Command. Enable or disable upscaling for the SSRTGI. This option makes the quality of edges in half and quarter resolution look closer to full. To use this option, the SSRTGI effect must be enabled. Variable. Print the value indicating if the subsurface scattering is enabled. Command. Enable or disable the subsurface scattering. Variable. Print the value of the SSS (subsurface scattering radius) radius. Command. Set the subsurface scattering radius: distance in the screen space, within which colors will be sampled. It controls how much wrinkles, pores and cavities will be blurred and highlighted. The higher the value, the farther subsurface scattering reaches. Too high values result in the ghosting effect. By the minimum value of 0, no subsurface scattering is rendered. Variable. Print the value of the SSS (subsurface scattering radius) color. Command. Set a subsurface scattering color used to simulate the subsurface component of skin lighting, i.e. the light that bounces inside of the subsurface tissue layers (epidermis and dermis) before exiting. For skin, subsurface color is reddish, due to blood circulating in skin tissues. Variable. Print the value indicating which resolution mode is used for subsurface scattering. Command. Set the resolution mode to be used for subsurface scattering. Variable. Print a value indicating which subsurface scattering quality mode is used. Command. Set the quality mode for the subsurface scattering. Variable. Print the value indicating if the screen-space bevels are enabled. Command. Enable or disable the screen-space bevels. Variable. Print the current rendering mode of the screen-space bevels. Better Edges - smooths vertex and surface normals of the object. In this mode, the relief created by using Normal Mapping will be smoothed along with the mesh edges. Better Normals - smooths only vertex normals. In this mode, only edges of the mesh geometry will be bevelled. Variable. Print a value indicating which screen-space bevels quality mode is used. Command. Set the quality mode for the screen-space bevels. Variable. Print the size of the screen-space bevel effect. Command. Set the size of the screen-space bevel effect. Variable. Print the value indicating if the noise that smooths bevels is enabled. Command. Set the value indicating if the noise that smooths bevels is enabled. It is recommended to use the noise with TAA enabled to avoid visual artifacts. The bevel noise is applied at a certain distance from the camera (i.e. if the camera is too far from the object with bevels, the noise won't be applied). Operations on the lighting and shading. Variable. Print the value indicating if the environment is enabled. Variable. Print the environment cubemap blending mode. Command. Set the environment cubemap blending mode. Variable. Print the current mode of haze rendering. Command. Set the mode of haze rendering. Variable. Print the environment haze gradient mode. Command. Set the environment haze gradient mode. Variable. Print the current number of lights per batch call. Command. Set maximum number of lights per batch call. Variable. Print the grid size in tiles per axis (8 by default). Command. Set the grid size in tiles per axis. Variable. Print the current maximum number of environment probes per object (available only for materials rendered in the forward rendering pass). Command. Set the maximum number of environment probes per object (available only for materials rendered in the forward rendering pass). Variable. Print the current maximum number of omni lights per object (available only for materials rendered in the forward rendering pass). Command. Set the maximum number of omni lights per object (available only for materials rendered in the forward rendering pass). Variable. Print the current maximum number of projected lights per object (available only for materials rendered in the forward rendering pass). Command. Set the maximum number of projected lights per object (available only for materials rendered in the forward rendering pass). Variable. Print the current maximum number of voxel probes per object (available only for materials rendered in the forward rendering pass). Command. Set the maximum number of voxel probes per object (available only for materials rendered in the forward rendering pass). Variable. Print the current maximum number of world lights per object (available only for materials rendered in the forward rendering pass). Command. Set the maximum number of world lights per object (available only for materials rendered in the forward rendering pass). Variable. Print the value indicating if rendering of per-light lens flares is enabled. Command. Enable or disable rendering of per-light lens flares. Variable. Print the value indicating whether screen-space ambient occlusion is enabled. Command. Use screen-space ambient occlusion. Variable. Print the noise reduction for the ray-traced SSAO is enabled. Command. Enable the noise reduction for the ray-traced SSAO (Screen Space Ambient Occlusion). This option reduces noise by using blur effect. Ray-traced SSAO calculation is available only when the SSRTGI technique is enabled. Variable. Print the current threshold value for the ray-traced SSAO. Command. Set the threshold value for the ray-traced SSAO. Ray-traced SSAO calculation is available only when the SSRTGI technique is enabled. Variable. Print the ray tracing for SSAO is enabled. Command. Enable the ray tracing for SSAO (Screen Space Ambient Occlusion) calculation. When enabled, SSAO provides more realistic shadows between the objects. Ray-traced SSAO calculation is available only when the SSRTGI technique is enabled. Variable. Print the value indicating whether the cavity option for the SSAO is enabled. Command. Enables or disables the cavity option for the SSAO effect. This option improves (sharpens) the look of junction contours at low resolutions, so it should be used for detail enhancement (small stones, bolts and so on). Variable. Print the intensity of sharpening of contours for the cavity option. Command. Set the intensity of sharpening of contours for the cavity option. Variable. Print the size of junction contours area for the cavity option. Command. Set the size of junction contours area for the cavity option. Variable. Print the value of the SSAO radius. Command. Set the radius of SSAO (Screen Space Ambient Occlusion). Variable. Print the current threshold value for the SSAO. Command. Set the threshold value for the SSAO. Variable. Print the value of the SSAO intensity. Command. Set the intensity of the SSAO (Screen Space Ambient Occlusion) for the scene. Variable. Print the value of the SSAO intensity for the scene object's lighted side. Command. Set the intensity of the SSAO (Screen Space Ambient Occlusion) for the scene object's lighted side. Variable. Print the value of the SSAO intensity on reflections. Command. Sets the intensity of SSAO (Screen Space Ambient Occlusion) on reflections. Variable. Print the value indicating the quality of screen-space ambient occlusion. Command. Set screen-space ambient occlusion quality. Variable. Print the value indicating the resolution of screen-space ambient occlusion. Command. Set screen-space ambient resolution quality. Variable. Print the value indicating if screen-space ambient occlusion noise is enabled. Command. Enable the screen-space ambient occlusion noise. Variable. Print the value indicating if geodetic pivots are shown. Variable. Print a value indicating whether shadows are rendered or not. Variable. Print a value indicating whether alpha test for shadows is enabled. Command. Enable or disable alpha test for shadows. Variable. Print the value indicating the current precision of soft shadows. Command. Set the value indicating the current precision of soft shadows. Variable. Print the value indicating if the screen-space shadows are enabled. Command. Enable or disable screen-space shadows. Variable. Print the distance starting from which shadows will not be rendered. Command. Set the distance starting from which shadows will not be rendered. Variable. Print the value indicating if shadow shafts are enabled. Variable. Print the value of the contrast used for volumetric shadows. Command. Set the contrast used for volumetric shadows. Variable. Print the value of the volumetric shadows length. Command. Set the length of volumetric shadows. Variable. Print the value indicating if sun shafts are enabled. Variable. Print the color of the sun shafts. Command. Set the color of the sun shafts. Variable. Print the scale of the sun shafts. Command. Set the scale of the sun shafts, higher values produce larger shafts. Variable. Print the length of the sun shafts. Command. Set the length of the sun shafts. Variable. Print the attenuation value of the sun shafts. Command. Set the attenuation value of the sun shafts. Variable. Print the threshold of the sun shafts. Command. Set the threshold of the sun shafts. Variable. Print the value indicating if Parallel Split Shadow Map (PSSM) splits for world lights are enabled. Command. Enable Parallel Split Shadow Map (PSSM) splits for world lights. Variable. Print the value indicating if penumbra (half-shade regions) in color is enabled. Command. Enable penumbra (half-shade regions). Variable. Print the value indicating if the soft shadows are used. Command. Enable or disable the soft shadows. Variable. Print the value indicating if the quality of the soft shadows. Command. Set the quality of the soft shadows. Variable. Print the value indicating if the jittering for shadows casted by the omni light sources is enabled. Command. Enable or disable jittering for shadows casted by the omni light sources. Variable. Print the value indicating if linear interpolation of shadow cascades is enabled. Command. Enable or disable linear interpolation of shadow cascades, making transitions between cascades smoother. This option significantly affects performance, as 2 shadow maps are rendered in transition areas. Variable. Print a value of the downsampling rendering for clouds. Command. Set the downsampling rendering for clouds. This parameter determines clouds resolution based on current screen resolution. It has a significant impact on performance. Variable. Print a value of the dynamic coverage area for clouds. Command. Set the dynamic coverage area for clouds. This parameter determines visibility distance for coverage of FieldWeather objects. Variable. Print a value of the dynamic coverage resolution for clouds. Command. Set the dynamic coverage resolution for clouds. This parameter determines the quality of dynamic coverage texture for FieldWeather objects. Higher values make it possible to preserve texture details at high distances. Variable. Print a value indicating if the rendering of shadows from the clouds on the ground. Command. Enable rendering of shadows from the clouds on the ground. Variable. Print a value indicating if the interleaved rendering mode for clouds is enabled. Command. Enable the interleaved rendering mode for clouds. Variable. Print a value of the lighting cone sampling radius for clouds. Command. Set the lighting cone sampling radius for clouds lighting. Variable. Print the value of the lighting quality for clouds. Command. Set lighting quality for clouds. This parameter determines the number of samples used to calculate lighting for clouds. Variable. Print a value of the lighting trace length for clouds lighting. Command. Set the lighting trace length for clouds lighting. Variable. Print the current value of the noise step parameter for clouds. Command. Set the noise step parameter value for clouds. Variable. Print the current value of the noise step skip parameter for clouds. Command. Set the noise step skip parameter value for clouds. Variable. Print the current value of the noise iterations parameter for clouds. Command. Set the noise iterations parameter value for clouds. Variable. Print the current value of the noise lighting parameter for clouds. Command. Set the noise lighting parameter value for clouds. Variable. Print the number of samples used for clouds rendering. Command. Set the number of samples used for clouds rendering. Variable. Print the sampling quality set for clouds. Command. Set the sampling quality for clouds. This parameter determines the number of samples used and affects cloud density. Variable. Print a value indicating if the shadow shafts for clouds are enabled. Command. Enable shadow shafts for clouds. Variable. Print a value indicating if the simplified depth test for clouds is enabled. Command. Enable simplified depth test for clouds. Variable. Print a value of the soft intersection distance for clouds. Command. Set the soft intersection distance for clouds. Variable. Print a value indicating if rendering of clouds after all transparent objects (except water) is enabled. Command. Enable rendering of clouds after all transparent objects (except water). The commands described below affect only terrain (the ObjectTerrain class). Variable. Print a value indicating the current terrain texture anisotropy level. Command. Set the terrain texture anisotropy level. Variable. Print the value indicating if displacement mapping is enabled for terrain rendering. Command. Enable or disable displacement mapping for terrain rendering. Variable. Print the value indicating if displacement mapping for terrain rendering uses normals. Command. Enable or disable use of normals in displacement mapping for terrain rendering. Variable. Print the value indicating if decal-based terrain holes are enabled. Command. Enable or disable rendering of decal-based terrain holes. Variable. Print a value indicating what terrain albedo textures (coarse or refined) are used. Command. Set the type (coarse or refined) of albedo terrain textures. Variable. Print a value indicating what terrain mask textures (coarse of refined) are used. Command. Set the type (coarse of refined) of mask terrain textures. Variable. Print a value indicating what terrain normal textures (coarse of refined) are used. Command. Set the type (coarse of refined) of normal terrain textures. Variable. Print the value indicating if triplanar texture mapping is enabled for terrain rendering. Command. Enable or disable triplanar texture mapping for terrrain rendering. The commands described below affect only global water (the ObjectWater class). Variable. Print a value indicating the current water texture anisotropy level. Command. Set the water texture anisotropy level. Variable. Print the value indicating the current water texture anisotropy level. Variable. Print the value indicating if environment probes are enabled for water rendering. Command. Enable or disable environment probes for water rendering. Variable. Print the value indicating if voxel probes are enabled for water rendering. Command. Enable or disable voxel probes for water rendering. Variable. Print the value indicating if lights are enabled for water rendering. Command. Enable or disable lights for water rendering. Variable. Print the value indicating if writing depth for water in opacity buffer is enabled. Command. Enable or disable writing depth for water in opacity buffer. Variable. Print the value of water refraction quality. Command. Set the quality of water refraction. Variable. Print a value indicating if the water screen-space reflections are enabled. Command. Enable the water screen-space reflections. Variable. Print a value indicating which water screen-space reflections quality mode is used. Command. Set the quality mode for the water screen-space reflections. Variable. Print a value indicating if the increased accuracy for the water screen-space reflections is enabled. Command. Enable the increased accuracy for the water screen-space reflections. Variable. Print the value indicating if underwater shafts are enabled. Command. Enable or disable underwater shafts. Variable. Print the value indicating if shoreline wetness is enabled. Command. Enable or disable shoreline wetness. Variable. Print the value indicating which mode of panoramic rendering is enabled. Command. Enable panoramic rendering of the specified mode. If the panoramic rendering is enabled, underwater shafts and water line effects will be disabled. Variable. Print the value indicating if a query test is run. Command. Run an additional hardware occlusion query test before sending data to the GPU. Variable. Print the value indicating the number of frames required for the occlusion query update. Command. Set the number of frames for the occlusion query update. Make sure that the additional hardware occlusion query test is run. Variable. Print the value of the virtual screen resolution. Command. Set the virtual screen resolution. This option can be used to render video with high resolution (e.g. 8K) regardless of monitor's resolution. Variable. Print the current maximum FPS value, to which rendering FPS is clamped. Command. Set the maximum FPS value, to which rendering FPS is to be clamped. Variable. Print the value indicating whether the debug context is enabled. Command. Enable the debug context of OpenGL or DirectX 11. To come to effect, the command requires video_restart to be run after it. Enabling the debug context may cause performance drop (~30-40%). 1 to write all DirectX errors (red) and warnings (yellow). If the error occurred, it means that there is a mistake in API. 2 to write all DirectX errors (red) and warnings (yellow). If the error occurred, the engine will crash and the full callstack will be shown. 1 to write all OpenGL errors (red) and warnings (yellow). If the error occurred, it means that there is a mistake in API. 2 works in the same way as 1 mode. Operations on the Direct3D11 API. Command. Print the information about the hardware configuration. Variable. Print the value indicating if the Direct3D 11 level compute shader is applied. Command. Apply the Direct3D 11 level compute shader. Variable. Print the value indicating if tessellation is enabled. Operations on the OpenGL API. Command. Print the information on the graphics card. Command. Print the manufacturer of the OpenGL driver. Command. Print the version of the OpenGL driver. Command. Print the version of the OpenGL shading language. Command. Print OpenGL render extensions. Variable. Print the value indicating if the GL_ARB_compute_shader extension is set. Command. Set the GL_ARB_compute_shader extension. Variable. Print the value indicating if the GL_ARB_sample_shading extension is set. Command. Set the GL_ARB_sample_shading extension. Variable. Print the value indicating if the GL_ARB_tessellation_shader extension is set. Command. Set the GL_ARB_tessellation_shader extension. Variable. Print the value indicating if OpenGL errors are skipped. Operations on the OpenAL API. Command. Print the information on the sound card. Command. Print the manufacturer of the OpenAL driver. Command. Print the version of the OpenAL driver. Command. Print the available OpenAL sound extensions. Command. Print OpenAL context sound extensions. Variable. Print the value indicating if OpenAL errors are skipped. Command. Loads an external plugin. Command. Reloads an external plugin. Command. Quits and unloads an external plugin. Operations on the Bake Lighting tool. Variable. Print the current number of light bounces. Command. Set the number of light bounces. Variable. Print the current number of voxels computed and visualized per single frame. Command. Set the number of voxels computed and visualized per single frame. Variable. Print the current multiplier of voxel size. Command. Set the voxel size multiplier. Variable. Print the current screenshot format. Command. Set a screenshot format. A screenshot is saved in the bin/screenshots directory by default. You can specify another directory. Operations, representing information on the system memory. Command. Print information on the memory dump in form of the fragmentation map. Command. Dump memory pools (useful for offline analysis). Operations, representing information on the CPU. Command. Print information on the CPU and instruction set supported by it. Command. Print the CPU frequency in MHz. Command. Print the number of available CPUs. Operations, representing information on the system. Command. Print information on the engine binary. Command. Print information on the operating system and the engine build version. Command. Print the system memory size in Mbytes. Operations, representing information on the GPU. Command. Print the video card and driver versions. Command. Print the video memory size in Mbytes. Command. Print the number of available GPUs.